It's been almost three weeks since historic floods in San Jose, and many people are still looking for answers, including Mayor Sam Liccardo, who wrote a formal letter to the water district seeking more information. As city crews and residents continued cleaning up near Olinder Park on Monday, Liccardo responded to demands from residents on the cause of the floods last month after water from overflowing Coyote Creek gushed into an East San Jose neighborhood. In his letter to the Santa Clara County Water District, Liccardo requested more details so he can better prepare the city next time. One major issue is a sufficient warning system, and while city leaders try to come up with an effective, long-term solution, they also are looking at purchasing LRADs, or long-range acoustic devices, to warn potential flood victims. 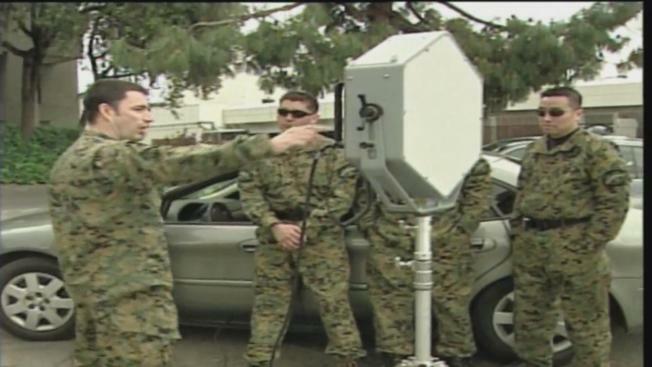 San Jose's SWAT team uses an LRAD when confronted wth a barricade situation. The LRAD makes a high-pitched sound akin to a car alarm, except much louder. That’s little consolation to flood victim Sue Evanicky, whose home on 19th street remains yellow-tagged, meaning she can go into it to retrieve items and assess damage, but she can't live there. "We’re struggling," Evanicky said. "This is Phase 4. I can't imagine when we start looking for appliances and furniture that we lost because none of that is covered, which was a shock." Evanicky also had the misfortune of falling victim to what she said were unscrupulous contractors who took off with her deposit money. "After the floods, I was vulnerable and so shocked and overwhelmed," she said. "I was desperate, so I took what came." Meanwhile, city and county crews have spent the past two weeks decontaminating parks and trails. They were at Rocksprings Park on Friday, and on Monday, crews installed tan bark in the play area at Olinder Park, covering an area where contaminated soil was removed. Hellyer Park, a p[opular weekend retreat for many families in South San Jose, is still closed. "It was pretty dangerous, so little kids couldn’t be walking around," park visitor Francisco Martinez said. "Right now, it’s just adults, and it’s pretty dangerous." Seven city parks remain closed indefinitely. I was disappointed that, despite repeated requests from our City Manager and myself more than a week prior to the hearing, the Santa Clara Valley Water District declined to send any engineers, hydrologists or managers with relevant expertise to our March 9 City Council hearing on the recent Coyote Creek flooding. As we've previously discussed, City staff has had difficulty eliciting information from the Water District in recent days that would enable us to better anticipate flooding, so I was equally disappointed to learn that your attorneys' concerns would compel your agency to decline to meaningfully participate in our public effort to identify and fix what went wrong to create the devastation of February's flood. We need answers to many important questions to prevent this kind of damage from happening again. While your Government Affairs Director read a formal statement on behalf of the Water District, he could not offer substantive answers to any of the questions posed by the City Council regarding stream flow data, flood protection, stream channel maintenance, and other issues that fall under the subject matter expertise and jurisdiction of the Water District. As I've said before, this event took place in my city, and I accept responsibility for fixing the shortcomings in our emergency preparation and warnings. To do so, we need the best information, and we need cooperation of the agency tasked with flood prevention and management. At our March 9 meeting, City staff, my colleagues and I publicly acknowledged the City's failure to provide adequate and timely notice to San Jose residents and businesses about the potential for flooding. We also approved a number of immediate actions that will help us avoid these issues going forward. I remain committed to working collaboratively with the Water District, the County, and our many other partners to fix these shortcomings as quickly as possible. To do this, we need all the facts about what happened before, during and after this event, as well as an open and honest discussion about the responsibilities of our respective public agencies when it comes to flood protection and mitigation. Since the Water District did not send a representative equipped to answer our questions at the March 9 hearing, I have included a list of a few of the questions raised by our City Council and the public, and have attempted to list them more succinctly for your convenience (see attachment A). Given the urgency of our task, we would appreciate the Water District's response to these questions as soon as possible. I hope that meetings between our respective staffs will enable forthright feedback about the findings and recommendations of the City's after-action report so we can immediately formulate a plan for addressing those items that will require action from both the City and Water District. Given the urgency of these issues, I also propose that we move up the date of our joint City Council - Water District Board meeting to take place the week of March 27th or the week of April 3rd, at a mutually convenient time, and that we focus that meeting on eliciting factual information relevant to our actions in the weeks ahead. Thank you for your prompt attention to both this request and to the continued invitations from our professional staff to engage in discussions on how we can better protect our residents from flooding in the future. • Does the Water District have any insights or opinions about the City's proposed improvements to its own warning systems and resident notification protocols? What additional improvements would the Water District suggest? • How does the Water District explain the large gaps between the quantitative descriptions of creek channel capacity that the Water District provided City staff the week before the flood, and the rates at which flooding occurred in Rock Springs, at William Street, Watson Park, and the mobile home parks near Oakland Road? • What is the degree of accuracy of the hydrologic model used by the Water District to predict the overflows from Anderson spillway, and why were the overflow estimates and timing of peaks changed so frequently in advance of and during President's Day weekend? • What is the Water District doing to improve stream gauge accuracy? Is the Water District considering additional stream gauges, for instance, at Rock Springs? • Data regarding stream flow rates in Coyote Creek, both during and immediately prior to the flooding, on the Water District website have been removed and altered since the flood on Tuesday, February 21st. Why? • Did the Water District's descriptions of Coyote Creek channel capacity account for sediment and vegetation growth in those channels? If not, why not and how much of the aforementioned gaps (in predicted and actual channel capacity) can be explained by sediment and vegetation? What are the other factors that could have contributed to the gaps in predicted and actual channel capacity? • Does the Water District monitor sediment accumulation and vegetation growth in the creeks for flood protection purposes? If not, is it the view of the Water District that these are not substantial factors in flood prevention or stream channel capacity? If so, what communication has the Water District had with the City or other Coyote-adjacent property owners about flood risk resulting from sediment accumulation and vegetation growth? • The Water District completed a study as recently as October 5, 2016 on flood protection needs in Rock Springs, and described in great detail (p. 21) the sources of information behind its channel capacity estimate (then 7,000 cfs) in that part of the creek. A few weeks later, the channel flooded at that location at a flow rate at least 2,500 cfs lower. Why? • For other segments of Coyote Creek that flooded in the recent storms, how recently were hydrologic studies performed to determine the creek channel capacity data provided by the Water District to the City of San Jose? • A Water District Emergency and Security Manager, Dale Jacques, was recently quoted in the Mercury News stating that the City of San Jose should not have relied on Water District data regarding channel capacity and flow rates, but should "augment our information with their own analysis." What analysis, exactly, should every city perform? Why can't cities rely upon the Water District's projections and data? Should every city and town in Santa Clara County should hire its own hydrologists? If so, will the Water District - as the sole agency collecting tax revenue to provide flood prevention and expertise countywide - provide funding for those additional staff? • The Water District suggests that they had field personnel monitoring conditions along the Coyote corridor prior to and during the event. Where were those staff positioned and what were they communicating to either the Water District's or the City's EOC? • Are there technological improvements that can be implemented with the Water District's sensors at key locations (e.g., Edenvale, William Street) that will provide a clearer indication of flood risk? • In light of City Attorney Rick Doyle's March 10, 2017 memorandum, can the Water District cite any written authority -e.g., a statute, court opinion, or contractual agreement - for its contention that individual property owners bear responsibility for clearing vegetation and removing sediment for flood protection within the creek channels of our County? • Given the fact that there are hundreds of property owners along Coyote and many other creeks in this County, does the Water District contend that each individual owner has responsibility for obtaining dredging and hauling equipment, and obtaining permits from the Water District and other agencies to perform the work? Beyond the post-flood statements of Water District spokesperson Rachael Gibson that "each property owner is responsible for clearing their own section" of the creek, what has the Water District done to proactively inform property owners Countywide of this purported responsibility? What has the Water District done to inform cities Countywide of this purported responsibility? • The Water District has several pages on its website that describe its work on sediment and vegetation removal within creek channels for flood protection. Is there any public information on the Water District's website that informs property owners how they should obtain dredging equipment, permits, and other requirements to preform stream maintenance for flood prevention purposes? • What does the Water District need from the City of San Jose and other property owners to perform flood-mitigating stream channel maintenance along the flood-prone portions of Coyote Creek? • The Water District asked voters to approve Measure B in 2012, listing among the projects within Priority El: "Vegetation Control and Sediment Removal for Flood Protection." According to the Water District, this parcel tax measure allocated $59.2 million (in 2015 dollars) to "support the District's ongoing vegetation control and sediment removal activities that reduce flood risk by maintaining design conveyance capacity of flood protection projects. These activities also provide access for maintenance personnel and equipment. The project includes: controlling in-stream vegetation growth, removing sediment at appropriate intervals, removing hazardous trees, and performing weed abatement and pruning to provide access and establish firebreaks." If the Water District is unwilling to take responsibility for comprehensive vegetation control and sediment removal, will the Water District make those funds available to individual property owners and cities throughout the County to do so? • The voters approved the Coyote Creek Flood Protection Project as part of the 2000 Measure B, allocating $32 million to the project. Since then, the district continually delayed implementation of the project, spending over $10 million on planning and design until placing the project "on hold" last year until FY 2019, "due to need for development of other planning projects that impact the Coyote Creek Project." What other projects took priority over Coyote Flood protection? Under what criteria were those projects deemed to be of higher priority? How was the public, including property owners and residents in the Coyote Creek floodplain, notified about this change? and why? • At the March 9th, 2017 hearing at City Hall, Mr. Callender communicated that the Safe, Clean Water and Natural Flood Protection Plan funded by the 2012 Measure B parcel tax no longer exists. What was this plan replaced with? • Priority C2 of the 2012 Measure B Safe, Clean Water and Natural Flood Protection Plan indicates that 5 out of 7 automated flood forecast and warning systems have been implemented along various creeks. Coyote Creek is not one of those. What is the status of such a system along Coyote Creek? How can the City participate in expediting its implementation? How does the Water District determine priority of these systems? Do these systems notify residents in multiple languages? • Priority E2 of the 2012 Measure B calls on increased coordination with local municipalities on flood communication. According to the Water District's published records, in May 2016, the Water District continued engagement with Sunnyvale OES, Cupertino OES, Cupertino Citizen Corps/CERT, and the San Francisquito Creek JPA. Why was San Jose not included within the District's coordination efforts under this priority? • The Rock Springs report, published in October 2016, indicates that flood protections for the neighborhood would likely involve constructing a floodwall or setback. Is the District considering options for a temporary floodwall between Needles Drive and Bevin Brook? • Did the Water District deliver sandbags to known flooding locations, such as Rock Springs and Williams Street, as it had in the flooding of 1997? If not, why not? • What is the maximum rate of outlet flow from Coyote Reservoir? • During the relevant days prior to and during the February floods, did the incoming flow to Anderson Reservoir from Coyote Reservoir - which had also overtopped in February - exceed Anderson's outlet flow capacity? Why did the District not mention inflows from Coyote Reservoir in its press releases and reports about the outlet flow from Anderson Reservoir and efforts to lower the water levels in Anderson? • What factors contributed to the Water District's decision to delay the release of water from Anderson Reservoir until January 9th? How did that decision affect the risk of flooding on February 21 st? • Could SCVWD have managed the Coyote-Anderson dam system more proactively (i.e. earlier release from the outlet pipe, earlier supplemental pumping over the spillway) to attenuate a large peak flow such as was experienced? We read Mayor Liccardo’s letter today and share his interest in determining the factors that led to the devastating flooding that occurred during the Presidents' Day Weekend. 2. We sent our Water District’s most senior government affairs and communications official, Rick Callender, to make a presentation at the government hearing--as well as to provide a series of answers to questions that the City desired information about. 5. On March 2, in a telephone call with the Mayor, I offered to have a joint meeting between the City Council and the District Board, but this offer was declined. Instead the Mayor invited us to be present in the audience at the City’s March 9 hearing. I followed up with the attached March 3 letter confirming that a staff representative would be present. The Water District is working closely with the City to improve the situation. We are interested in facts, not blame, which only serves to dishonor those who have been harmed and displaced by the flood waters. We all listened in sympathy to the Special City of San Jose City Council hearing, to the expression of sorrow, disappointment and anguish expressed by the residents of San Jose who were devastated by the flood waters. Their stories of losing homes, belongings, and mementos of great personal meaning to them and their families touched everyone's hearts. The impact of this flood on their lives, livelihoods, and their neighborhoods is immense. The Santa Clara Valley Water District has pledged to work with the City, County and other emergency service providers to do everything in our power to review, and improve, what can be done in the future to reduce the risk of the type of flooding that destroyed so many homes and deeply impacted so many of our residents. We have been carrying out this pledge and we will continue to do so. Some of the statements made by City officials at the City hearing (as well as Mayor Liccardo’s letter today) about what led to the flooding were made in good-faith, but without full knowledge or facts of how procedures, protocols, and data about water flow, creek maintenance, Anderson Dam, and other factors that led to their delay in notifying residents that these flood waters were going to impact the residents and neighborhoods. SCVWD followed the procedures and protocols necessary for a substantial weather event such as this one. We want to find factual, real, engineering and communication solutions to the issues faced by all. We believe that working together for the benefit of all residents is more important than short-term political theater. Again, and most importantly, we will continue to work cooperatively with San Jose to determine how to improve and better coordinate and communicate in the future as well as reduce flood risk for our residents and neighborhoods, as well as address the Mayor’s and the community’s questions, during our April community meetings which are currently being planned.